Award Sites! 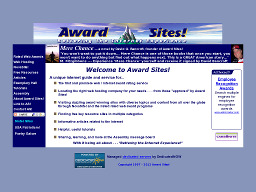 Primary purpose is to set standards for website award and review programs. Currently, there are 1,841 rated site awards listed in 8 levels (1.0 to 5.0, with the latter being the highest rated) and 25 specific categories. Awards with 3.0 to 5.0+ rating levels have a representative image(s) displayed. Other site features include key resource sites, articles, forum, and listing of novels by new authors. WebAwards By the Web Marketing Association is an annual event that Internet marketing experts use to improve website visibility. The organization is made up of Internet marketing, online advertising, PR, and top website design professionals and provides a benchmark by which all website development can be judged.